Bahrain is witnessing an economic leap like never before. New projects are constantly on the rise, expanding on an easy and comfortable lifestyle that also provides a booming commercial scene. With the aid of excellent communications and transportation services, the Kingdom of Bahrain has become headquarters for companies that operate in the GCC. Bahrain was named the 5th best place to live in the world, and today, we give you a glimpse of the largest development projects that helped it gain that spot. Bahrain Bay, the waterfront wonder, is one of Manama’s most important landmarks. It spreads over 500 thousand square meters and is valued at $2.5 billion. The bay provides residential, commercial, and touristic services, as well as social and public facilities. It is made up of three islands: the Northern Island, the Southern Island, and the central Four Seasons Island. An internal port was established by building two bridges that connect to the mainland. The project is home to three main developers: Arcapita Bank global headquarters, Raffles City, and the Kingdom’s first Four Seasons hotel. Diyar Al Muharraq is a holistic modern city that can be likened to large metropolitan cities across the globe. It lies on the North Eastern tip of the Kingdom in Muharraq Governorate. The project’s unique design combines elegant residential complexes with thriving commercial units and diverse entertainment venues. Water canals, private beaches, gardens, and parks all add to the project’s charm and present all the needs of modern living. Its various economic and commercial aspects, that include malls, five-star hotels, distribution centers and logistic support, make Diyar Al Muharraq an exceptional investment opportunity. It is comprised of two twin towers, Commercial East and Commercial West, each at 260 meters high with 53 floors. The towers are currently the tallest in Bahrain and include offices, retail shops, residential units, commercial units, and entertainment venues. Bahrain Financial Harbour holds one of the most technologically advanced infrastructures in the region. Al Areen development project lies in the west of the Kingdom, across 2.14 million square meters. It provides a blend of health, family, business, and leisure tourism with a value of investments of $2 billion. Al Areen has attracted several large projects that range from residential and commercial to hospitality and entertainment. They include “Lost Paradise of Dilmun” water park, Al Areen Hotel, Al Waha Resort, Oryx Hills, Downtown Al Areen, Sarab Al Areen, Al Areen Palace & Resort, in addition to a number of residential complexes and recreational facilities. It is considered one of the most ambitious development projects in the Kingdom and a landmark in the world of island resorts of the 21st century. It boasts over 1,000 coastal villas and apartments, offices, hotels, health spas, parks and recreational facilities. 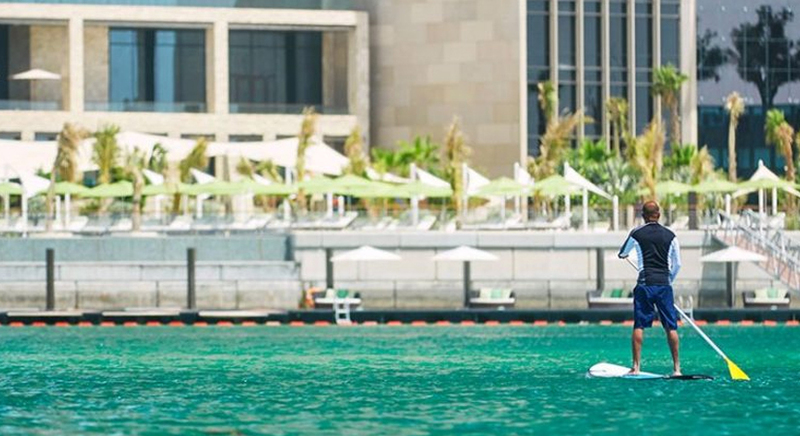 As well as mosques, international schools, retail malls, restaurant, a marina that can accommodate up to 400 boats, and a championship 18-hole golf course designed by Ernie Els. Amwaj Islands is a development project that holds the largest number of manmade islands in Bahrain. It lies in the Northeast of the Kingdom, near the coast of the island of Muharraq. The project sprawls over 2.79 million square meters and is the first project to allow foreigners 100% ownership. It is connected to the mainland via North Manama Causeway, which is approximately 1.8 kilometers long. Amwaj is home to skyscrapers with residential and commercial units, a marina that can hold 140 boats, a school, university, hospital, gas station, parks, restaurants, and cafes.